Liverpool University Press: Books: One People? One People? is the first book-length study of the major problem confronting the Jewish future: the availability or otherwise of a way of mending the schisms between Reform and Orthodox Judaism, between religious and secular Jews in Israel, and between Israel itself and the diaspora—all of which have been deepened by the fierce and continuing controversy over the question of ‘who is a Jew?’ One People? is a study of the background to this and related controversies. 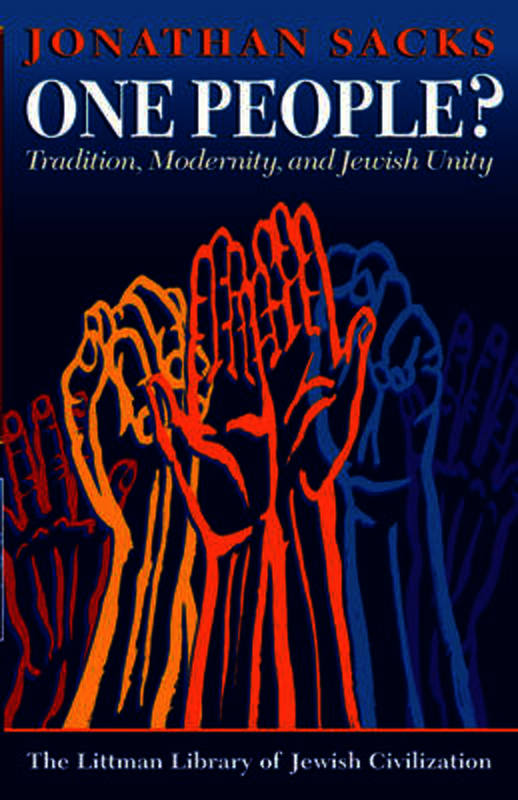 It traces the fragmentation of Jewry in the wake of the Enlightenment, the variety of Orthodox responses to these challenges, and the resources of Jewish tradition for handling diversity. Having set out the background to the intractability of the problems, it ends by examining the possibilities within Jewish thought that might make for convergence and reconciliation. The Chief Rabbi employs a variety of disciplines—history, sociology, theology, and halakhic jurisprudence—to clarify a subject in which these dimensions are inextricably interwoven. He also explores key issues such as the underlying philosophy of Jewish law, and the nature of the collision between tradition and modern consciousness. Written for the general reader as much as the academic one, this is a lucid and thought-provoking presentation of the dilemmas of Jewish Orthodoxy in modernity. Jonathan Sacks is Chief Rabbi of the United Hebrew Congregations of the Commonwealth. Educated at the University of Cambridge, he was formerly Principal of Jews College, London, and 1990 BBC Reith Lecturer. Dereleh Eretz: Jewish or Secular?